Junius on UKIP: > Stuff You - I'm Alright Jack!! Farage the Leech. > Stuff You - I'm Alright Jack!! Farage the Leech. It is interesting to note that Bruno Waterfield has written now about a story he was tipped off about 6 years ago.... Better late than never, we guess. "MEPs including Nigel Farage and senior Conservative, Labour and Liberal Democrats benefit from a secretive, heavily subsidised EU second pension scheme that will cost the taxpayer an extra €227.7 million (£187 million), it can be revealed. Thirty-eight of Britain’s 73 serving MEPs are members of the European Parliament’s “Additional Voluntary Pension Scheme” meaning they could receive over £41,000 a year extra above and beyond their main EU pension. The “actuarial deficit” of the scheme – the black hole that the taxpayer is liable for – rocketed by €72.1 million (£60 million) in 2012 and is now £187 million in the red, The Telegraph has learned. 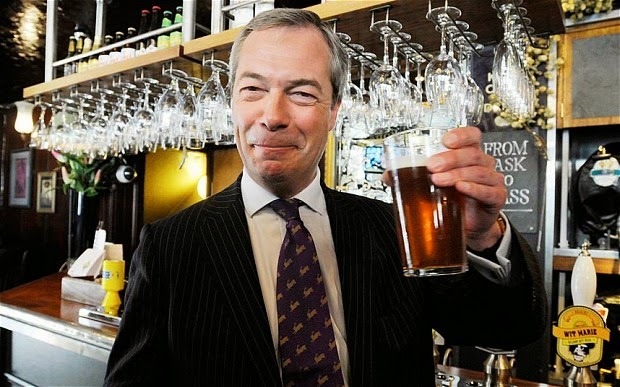 Mr Farage is one of the MEPs known to be in the scheme, which keeps the identities of its members a closely guarded secret despite the fact that 66 per cent of its assets come from public funds. He defended his participation in the scheme that could give him a combined pension pot worth an estimated £71,000 a year by 2019, if he remains as a British MEP after elections to the parliament on May 22. Syed Kamall, the leader of Conservative MEPs and Glenis Willmott, who leads the European Parliamentary Labour Party, are among the scheme’s members, as well as Sir Graham Watson, the president of the EU-wide Alliance of Liberals and Democrats for Europe. Their names are only known following the publication of leaked documents by Hans-Martin Tillack, a German investigative journalist and the Open Europe think tank. British taxpayers have already contributed over £100 million to the fund. European Union court papers show that the fund will be entirely bust by 2026 at the latest, despite being closed to new entrants in 2009, with the public purse left with an additional bill of £187 million. During the 15 years that the second fund was open for business, a participating MEP’s monthly contribution was £982 a month. This was topped up by £1,965 of public money per month."